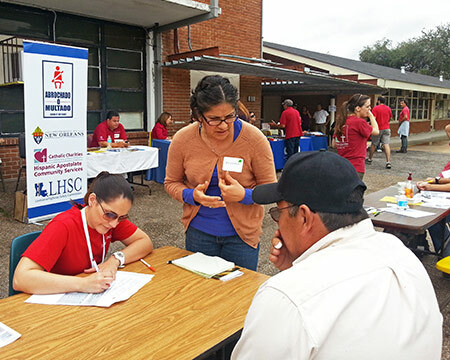 Translation and interpreting students at Loyola University New Orleans aren’t simply taking classes; they’re putting their training to good use volunteering as Spanish-English interpreters at community health care clinics and other charity programs in the New Orleans area. 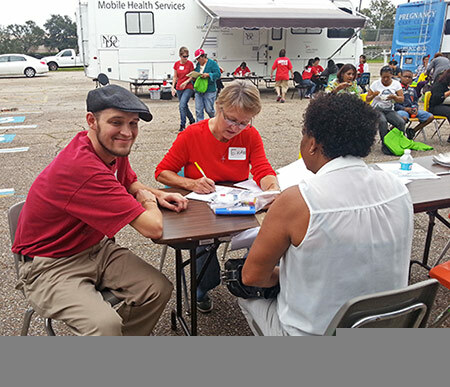 Recently, the students volunteered at a health clinic sponsored by the Hispanic Apostolate and Catholic Charities Saturday, Nov. 16, in Metairie where they helped Hispanic patients access needed medical care. The students are enrolled in Loyola’s new Spanish/English Translation and Interpreting Certificate Program, which is the first such program in the Gulf region. It prepares professional interpreters and translators to meet the growing demand for their services in the health care and legal fields. In fact, the students are witnessing firsthand the demand for these services. Eight students from the program volunteered as Spanish interpreters for a massive charity dental clinic held Nov. 3 at Mardi Gras World in New Orleans. Organized by the American Dental Association’s Mission of Mercy, the clinic offered free dental services to thousands of low-income patients—but many did not speak English. The students are paying it forward in other ways, too. They are translating into Spanish authentic materials for New Orleans-area nonprofits. What would normally cost these organizations thousands of dollars, the students are doing for free. So far, they’ve translated into Spanish an entire 40-page student handbook for NET Charter High School and various materials for Unity of Greater New Orleans, Grace House and Luke’s House Clinic. For the Lake Pontchartrain Basin Foundation, the students translated into Spanish panels describing coastal restoration for use in a museum display. “These efforts are a reflection of Loyola’s mission of integrating a comprehensive view of the world by forming first-class leaders committed to changing society by promoting justice and equality for all, including people with limited or no English proficiency,” Philip said.